It is really hard to believe that my mother has been gone for nearly 23 years. In the first few years after her death, every anniversary, every birthday, and many days ending with -y were triggers. Yep, pesky triggers that could cause any long lasting "up" period to come to a crashing end. I had learned about the effects of anniversary dates many years before Mom's death in some class or another -- priesthood training or psychology.... I sometimes anticipated and readily recognized what was happening and could often ward off any severe mood swings. Today? Am I bothered about today? Yes. I've been looking at the calendar all week. Mom would have been 84. How do I feel? I really just want to crawl back into bed and sleep all day. I won't. The funny thing about birthdays is that my family rarely celebrated them. Sure, we got a card from Mom & Dad with cash and a cake when growing up at home. But, at some point birthdays were less important. It took the efforts of the Harris boys' wives du jour to get us together as adults. We celebrated a few milestones like one of us turning 40 or 50 and even snapped a few commemorative photographs. Birthdays just never were very big events. Today, I miss my family. I miss having a whole family. I miss Mom, Dad, and Gary. I got past the anniversary of Dad's death. I am managing today and sort of hope that the end of May, when Gary passed, gets here and goes quickly. Yes, I'll manage. I'll be okay. 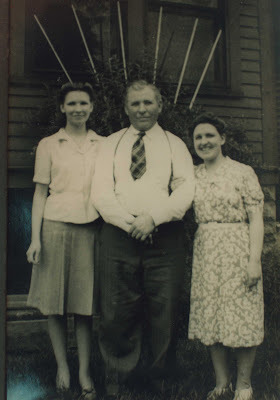 From left to right in the photograph , my mother, Irma, Grandfather Albert Fuhrwerk, and my mother's sister, Helen.